The canton of Vaud's marketing slogan is "Lake Geneva Region". While it may be true that it is the largest Swiss canton on the shores of Lake Geneva, stretching from Noville in the East to Mies in the West, the canton is so much more. The Vaud territory also includes swaths of land in the Alps (Château d'Oex), Sainte-Croix on the Southern part of the Jura and tracks of land along Lac de Neuchâtel and Lac de Môrat. With such a diverse geography, the canton of Vaud is one of Switzerland's most diverse cantons. Experiencing this area has been a wish of mine for some time. With my degree in classical philology, Avenches is a city that has called my name for years. And finally, I had the chance to visit Avenches and the forgotten Northern region of canton Vaud. My inner philologist rejoices on the tour of the ancient Roman ruins. The most dominant remains of the settlement, which was once home to more Romans than present day inhabitants of Avenches, are the theater, the amphitheater and two pillars that belonged to the old temple. Our medieval relatives thought it was smarter to use stones to build walls than preserving old structures. My guide, an elderly lady originally from Basel and dressed in Roman attire, helps to transport me back 2000 years. The museum in the tower by the amphitheater is well worth the visit, especially for the replica of the golden bust of Marcus Aurelius. The well-preserved amphitheater plays host to numerous musical spectacles each year, from rock concerts to the military tattoo. If you love brass band music, the tattoo is not to be missed with the views being topped by the acoustics. Which canton are we in? Use your SBB SwissPass to rent an e-bike, then head from Payerne towards Estavayer-le-Lac in the canton of Fribourg (but still at Lac de Neuchâtel). Before you leave Payerne, though, you will want to stop in a bakery and buy a Gâteau du Payerne for energy along the way. Today, Payerne is famous for its air show, but it used to be a major parish of the Abbey of Cluny. The latter is currently being restored after many botched attempts at maintaining the mini-Cluny standing inflicted the structure with more damage than help. On the way to the medieval town of Estavayer-le-Lac, you will ride through rolling hills and some of Switzerland's last tobacco fields. It turns out that for the big tobacco firms like Philipp Morris to stay in Switzerland, they also need to support tobacco farmers and produce a certain amount of tobacco locally. Arriving in Estavayer-le-Lac is like taking a trip back in time. The city and the castle that houses the police station are immaculately kept. From there, it is nice to cycle parallel to the lake through one of Switzerland's largest marshlands nature reserves, which incidentally was also a place where some of the first people settled in Switzerland. We cycle up to Vully-les-Lacs where there is a giant water tower. This place offers uninterrupted views, but it is not for the faint of heart. Those traveling in the fall need to take in some of the wine festivals in the area. Until this trip, I was not a big fan of wines from Vaud. However, over the course of several meals and the visit to a local wine festival, I was introduced to some fantastic wines. 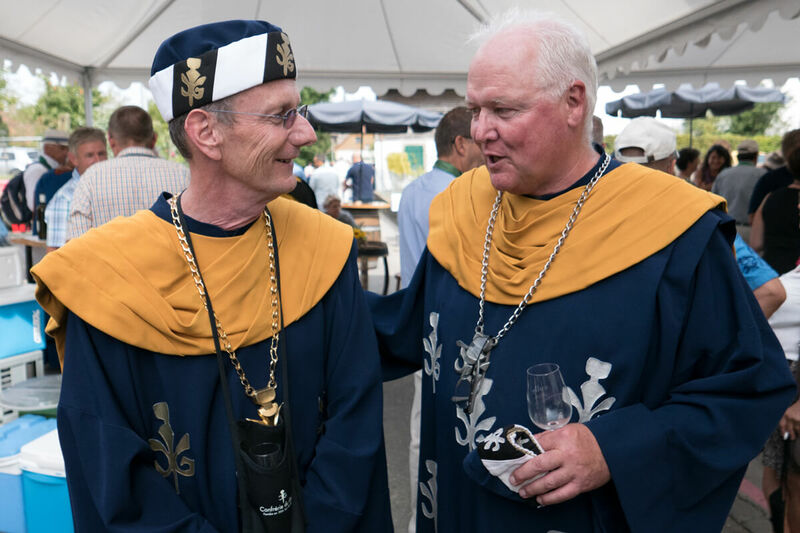 The Confrérie du Guillon, a fraternity or winemakers, are safe-keepers of the Vaudoise wine tradition. Each group has a costume that harkens back to medieval times while also making me think "Water Buffalos in the Flinstones." From Vully-les-Lacs, the Avenches train station where the bikes can be parked is only an hour away. You can either go directly or via Lac de Môrat. Once you are cleaned up and refreshed, grab dinner at the restaurant of Hotel de la Couronne in the central square of Avenches. You've earned it, even if you have used an e-bike! And don't forget to order a nice bottle of wine with that. This summer or fall, when you are planning your Swiss weekend getaways, make a bike trip around the historical region of Northern Vaud a destination. It is only a few hours with the train from the Zürich main station, is very affordable and off the beaten track of many tourists. The views, the wine and the cuisine are also fantastic as you travel from prehistoric settlements to Roman ruins and medieval castles. With the e-bike, the hills are easy to master. But in order to climb the big ones, you will also need to peddle some. So, don't get too lazy on the flats because you only have so much battery. You better preserve the battery for going uphill than just cruising along flat stretches of country road.